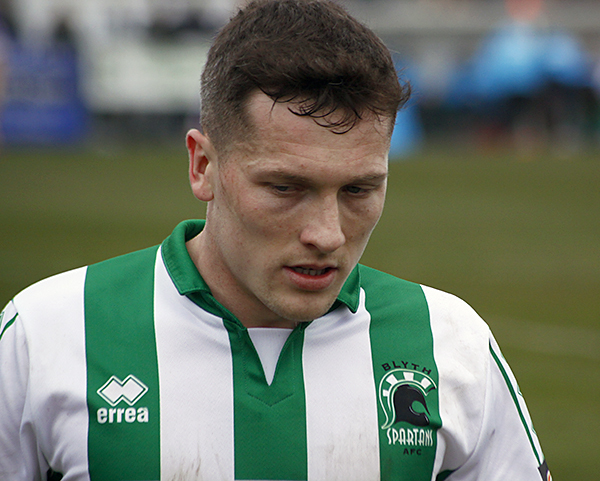 Spartans boss Alun Armstrong made four changes from the side that dispatched Nuneaton in midweek, with Louis Laing sitting out the first of his three game suspension. Perhaps as a credit to how Spartans nullified Stockport, manager James Gannon made two changes at half time, including bring on top scorer Matty Warburton. And it seemed to have an impact as the home side bombarded the Spartans box with a series of corners. But out of the blue it was Spartans who almost doubled their advantage 6 minutes into the half. Stealing the ball in midfield, Green slipped in Maguire who beat the offside trap before laying the ball across goal for Rivers to tap home, but the Spartans winger could only hit the bar with the goal at his mercy. The game started to turn scrappy as Spartans were more than happy to disrupt their opponents, but Stockport did manage to carve out a chance on 55 minutes. Duxbury’s cross from the left hand side took a fortunate deflection and found its way to Osborne, but his point blank header was well saved by Peter Jameson. Stockport’s bad day at the office continued as they struggled to get through a stubborn Spartans defence well marshalled by Nathan Buddle and Jordan Watson, and their day was probably best summed up by Duxbury gifting two successive throws straight to a Spartans player – much to the annoyance of the home crowd.